All transactions are safe and secure with a reliable history in online purchasing behind each of our associates. Buy the I Got a Fever and the Only Prescription is More Cowbell t-shirt to own More Cowbell clothing and merchandise. This more cowbell shirt features the entire quote from the SNL video skit. Christopher Walken's face lays in the middle of the tee to the left of the quote. The cow bell catchphrase is printed in grey. 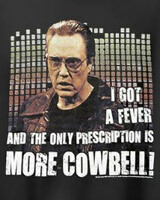 The entire tee reads, "I got a fever and the only prescription is More Cowbell!" The t-shirt is popular because the design effectively and creatively conveys the entire quote from the Saturday Night Live video skit. Wear it when your Gene Frenkle costume is dirty. In addition to the I Got a Fever and the Only Prescription is More Cowbell tee above, browse the More Cowbell Clothing Gallery for more apparel like men's and women's clothes, kids shirts or hoodies.